White Van Man comes perilously close to hitting a cyclist. He’s turning right and encroaching on the cycle lane. Two bicycles squeeze through before he can block the path, another strays into the turning area to continue. White Man Van hoots angrily. Surely he is in the right? The cyclist turns and remonstrates. He feels justified. And besides, one day he’ll incorporate this incident into a news story and take the moral high ground. That’s the interesting thing about traffic: there are so many grey areas. Whose right of way is it, what’s the correct etiquette on indicating, the list goes on. No wonder we get so annoyed on the country’s roads! 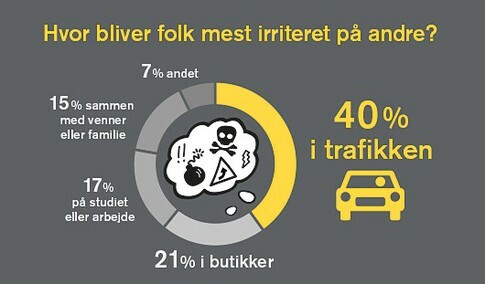 According to a new Megafon survey for the Vejdirektoratet road directorate, we are most likely to get annoyed in traffic – most particularly congestion. Some 40 percent of Danish residents say it is the situation most likely to make them see red – most particularly when other drivers occupy the fast lane on a dual carriageway or motorway. “We tend to consider that our own behaviour is far better than others in traffic,” commented Marianne Foldberg Steffensen, the head of the road safety at the directorate. Some 89 percent of the respondents believe they drive safely and that only 40 percent of other motorists do. Coming a distant second was shopping, which was cited by 21 percent of the participants in the survey. Our workplace scored 17 percent, friends and family 15 percent and other environments 7 percent.